Pet Carriers for American Staffordshire Terriers: Top 3 Picks! Pet Carriers for American Staffordshire Terriers: Top 3 Selections for Am Staffs! The American Staffordshire Terrier is quickly becoming a favorite family dog. 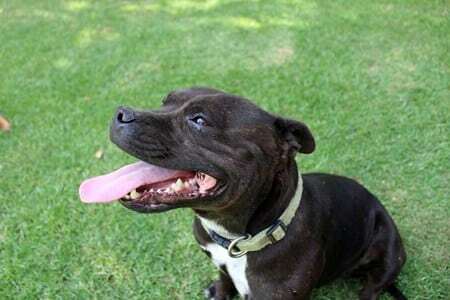 With a medium-sized build, the Amstaff is noted for being courageous, loyal, and friendly. It’s no wonder more people are choosing to bring these beautiful dogs into their home. But, they can weigh up to 88 pounds when they are fully grown. Are pet carriers still an option? The answer is yes. Even though Amstaffs can get a bit larger, there are a variety of different pet carriers meant for their size and weight. Because they are such a family-oriented dog, It’s normal for you to want to travel with them wherever you go. You’ll love being able to bring them, and they’ll love spending time with you. While it might seem overwhelming to travel with a larger dog like this, it’s all about having the right equipment and gear. When it comes to choosing the right pet carrier, it’s important to look at all the included features, not just size. The most important factor to consider when choosing a carrier for your Stafford is safety and comfort. Whether your dog is used to travel or not, making sure they have everything they need for security while they’re in a carrier should be your highest priority. 1 What Are the Best Pet Carriers for American Staffordshire Terriers? 1.1 Should I Travel with My Amstaff? 3 What Is the Right Dog Carrier for My American Staffordshire Terrier? What Are the Best Pet Carriers for American Staffordshire Terriers? This guide will cover three of the top pet carriers for Amstaffs. We’ll go over specific features you should look for when making a decision. It’s also important to recognize why you’ll be using the carrier. Once you’re able to determine how and where you want to travel, the selection process for the right crate can be easier. 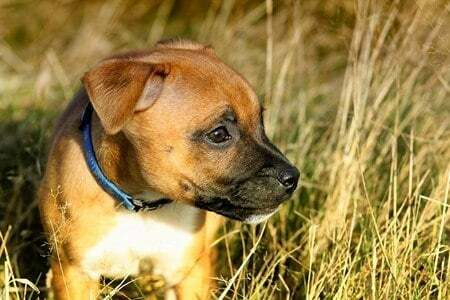 Knowing the purpose of the pet carrier itself, as well as your Staffordshire Terrier’s personality, will help you to make the right selection. The carriers (below) feature quality safety precautions and extra features that will make traveling with your dog enjoyable for both of you. Should I Travel with My Amstaff? It’s normal for any pet owner to be a bit hesitant about traveling with their dog at first. Since they are a part of the family, it’s natural to want to take them with you. However, for most pet owners, the dog’s safety and comfort come first. You can travel safely with your Staffordshire Terrier. They are such loyal family dogs, and they’ll love being able to go with you on your travels. There are a few tips you should keep in mind before you start traveling with your dog, whether you plan on taking road trips or bringing them on a plane with you. Get your dog used to their crate or carrier several weeks in advance. 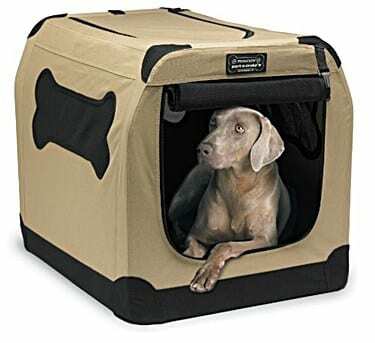 If the carrier doubles as a kennel, make sure they are comfortable going in and out on their own. Try keeping it in your home and encouraging regular use. You never want to force a dog into a crate of any kind, as it can create anxiety or even aggression in some dogs. Top-loading crates are a good option for dogs who are naturally more anxious. If you plan on air travel with your dog, contact the airline you’re using ahead of time to be sure of their specific guidelines. More and more airlines have become pet-friendly, but there are some restrictions to consider that can vary by company. Additionally, you can prepare your dog for flying by making sure they are okay with noise, and that they can comfortably stay in their crate for several hours. Whether you’re flying with your dog or traveling another way, it’s important to make sure they are up to date on all of their shots and vaccines. Accidents can, unfortunately, happen on trips. Animals get sick from time to time, too. Making sure your dog is up to date with everything they need can offer peace of mind. Keep your dog well-hydrated at all times. Choosing a carrier that has room for a water dish can be of benefit. If your dog starts to get anxious, they may pant more and get warmer. Making sure they have enough to drink to keep them cool, and calmer. Make sure your dog has something to occupy them during your travels. Keeping their favorite toy or activity with them in the carrier can be of help in keeping them distracted. A toy they are familiar with or something that smells like home can also help with anxiety and stress. If you’re traveling somewhere on vacation, check with your hotel before bringing your dog along. Again, most places are pet-friendly, but some hotels and motels don’t allow certain breeds, sizes, etc. You wouldn’t want to get to your destination only to find out your dog isn’t allowed. One of the best things you can do when traveling with your Amstaff is to remain calm. Whether your dog is a seasoned pro at traveling, or they get anxious, it will only make matters worse if you appear jittery and nervous, too. Your dog will easily be able to recognize your nerves, and it can cause them to become even more stressed. When selecting a carrier, it’s important to recognize your dog’s personality. If they get anxious easily, you may want to choose a top-loading pet carrier that is easier to place them in. You can also work with them ahead of time to prevent travel anxiety. One thing to keep in mind is that Staffords are not considered to be ‘toy dogs.’ You can still select a quality, fashionable bag for them. However, they may not do well with over-the-shoulder carriers or smaller bags. It can be unsafe for them, and uncomfortable for you. American Staffordshire Terriers are an interesting breed when it comes to traveling because they are considered ‘medium’ sized. So, choosing the right bag can feel a bit overwhelming. The Petnation Port-A-Crate works double-duty as a carrier. It’s a great way to crate train your dog at home. However, it’s lightweight, easily collapsible, and easy to travel with. So, you can take it with you wherever your dog might go. Plus, it works in both indoor and outdoor scenarios, so your pet can feel safe and secure no matter where they are in the world. This soft-sided dog crate is just as sturdy as its metal counterparts. It will allow your Amstaff to feel comfortable in their own ‘den,’ which can help to ease travel anxieties. Proper ventilation: The crate features perforated windows that allow for sufficient airflow. This will allow your dog to stay cool and calm, without getting overheated. Two doors: One of the best features for anxious dogs is the two-door system. Your dog can either go in the front door on their own, or you can lower them in through the top door. Lowering them in through the top can be much less traumatic for a dog who doesn’t want to be forced into a crate. Extra safety measures: Both doors feature fastening straps and industrial-strength zippers. Even if your dog is hyper, anxious, or playful, they won’t be able to chew through the entrances or paw their way out. Easy to clean: Because you can either use this carrier for crate training or travel, the manufacturer knows that accidents happen. They’ve created the crate with water-resistant material for easy clean-up. It is also machine washable. One of the drawbacks of this carrier is that it isn’t meant for air travel. If you want to take your dog on road trips, or they travel back and forth between two places frequently, this is a great ‘home’ for them always to feel comfortable in. It’s durable enough to hold up to a lot of travel. However, it’s not approved by airlines and could be a little too big and bulky to take with you on a plane. If you are looking for a pet carrier for air travel, one of the best is the Aspen Pet Porter Plastic Kennel. It’s a great option for car travel, too, as it’s designed to keep your dog safe and secure no matter where you go. Many people opt for soft-sided pet carriers because they can be easier to tote around. However, when you have a bigger dog sometimes a plastic carrier is the best option. Bigger dogs are typically stronger and may be able to tear through soft-sided carriers. 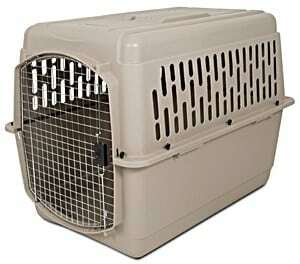 A plastic crate like the Aspen Pet Porter prevents that from happening and keeps your dog safe. Airline approved: While it’s still important to call your airline to make sure that the Aspen Pet Porter Plastic Kennel is appropriate, it has been cleared by most significant airlines within the United States. Plus, it’s sturdy enough that you don’t have to worry about your dog getting jostled around if they have to go below the plane in cargo storage. 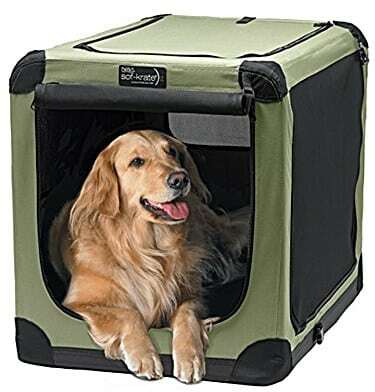 Lightweight: Even though this is a hard, plastic carrier, and not a soft-sided kennel, it’s very lightweight and portable. That’s what makes it so great for travel. Made from heavy-duty plastic for durability: The material of the carrier may be lightweight, but it is also incredibly sturdy and durable. You don’t have to worry about external factors ripping it as you might with a soft-sided carrier. A wide door with secure chrome latch: Unlike many soft carriers, there are no zippers involved with this crate. Instead, it features a chrome latch. You’ll never have to worry about a zipper getting stuck or breaking. The Aspen Pet Porter Plastic Kennel comes in a variety of different colors to fit your own sense of style. It can be difficult sometimes, to take a bigger dog on an airplane. But, this carrier allows your pet to be safe during travel. Because it is so lightweight and durable, it doubles as a kennel you can use at home. The more comfortable you can get your dog with the Aspen carrier at home, the easier it will be to travel. 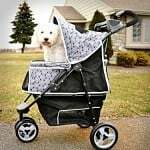 The NOZTONOZ Soft-Krate allows you to give your pet the comfort and familiarity of their own personal kennel while being durable and portable enough to have them travel with you wherever you go. It can be used inside or outside the home and can be used for crate training. The best thing about the NOZTONOZ Soft-Krate Indoor/Outdoor Pet Home is that it can be used for quick trips to the vet, or for long road trips and family travels. It is considered to be a soft-sided dog crate, covered in a tent-like material. However, that material is covering a steel frame, which gives the crate a lot of strength and stability for travel. One of the most significant issues people have when traveling with a larger dog in a carrier is making sure the carrier itself is portable. The NOZTONOZ Soft-Krate breaks down quickly. It has an accordion-like design that doesn’t require you to take anything apart or put it back together. Close it within seconds, and re-open when you’re ready to use it. Easy-to-clean: Because of the tent-like material, most accidents can be wiped away with a damp cloth. You can also take the exterior lining off and place it in the washing machine for deep cleaning. Lightweight: This soft-sided crate has the benefit of being both sturdy and lightweight, thanks to a steel frame that is easy to carry. It isn’t bulky or heavy like some other metal or plastic carriers. 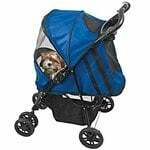 Well-ventilated: Your dog will get plenty of air circulation whenever they are in this carrier. It will keep them from overheating and can help with anxiety or stress. Three zip-open doors for comfort and safety: There are multiple entrance options for your dog so they’ll be comfortable going in and out of the crate as needed. The sturdy zippers ensure that the doors won’t accidentally open mid-travel. This isn’t a carrier that is meant for dogs who are heavy chewers. While the material is strong and durable, it can be torn if your dog is determined enough to chew or claw their way out. However, if your dog is calm and doesn’t have a problem spending their time in a kennel-like carrier, it’s a perfect solution for all types of travel. It can also be used at home. But, if you strictly want to use it to take your dog with you on your adventures, storage is a breeze. Different travel carriers are better suited for specific situations. While the three carriers all have their own specific benefits, some are better for certain types of travel than others. Before you decide on the best carrier for your dog, determine which type of traveling you’ll be doing. If you plan on taking to the skies frequently, an airline-approved carrier is a necessity. If shorter trips in the car are on your list, something lightweight and durable might be more appropriate. You know your pet’s personality better than anyone and can determine what might make them most comfortable. No matter how you choose to travel, choosing the right kind of carrier for the job is important. Pay close attention to the features to see which one might fit best with your travel plans. What Is the Right Dog Carrier for My American Staffordshire Terrier? We hope some of the tips and advice from this guide will allow you to feel confident when traveling with your Amstaff. Because they are such a family-friendly dog, it’s only natural that they go with you as often as possible. If you can practice some of the techniques listed here, your dog will have a great time traveling in a quality carrier. The travel carriers listed above are all excellent selections. They each have special benefits, and it’s up to you to determine which one will be best for your Stafford. Again, determining which traveling you plan on doing should be one of the most significant factors for your choice. Here is some advice on picking a pet carrier for air travel. One thing you don’t have to worry about is safety. It should always be the number one priority when choosing a travel crate. These top carriers have extensive safety features to keep your dog secure and comfortable, no matter what the circumstances may be. If you’re ready to plan your next family trip, or want an easier way to take your American Staffordshire Terrier to their next vet appointment, look no further than these options. Durable Pet Carriers for Puppies That Provide Superior Comfort!